Mansions Skyluxe - the super luxury apartment project in Golf Links, Trivandrum.Wake up to the freshness of carbon-neutral environs at the upscale residential locale of Golf Links. 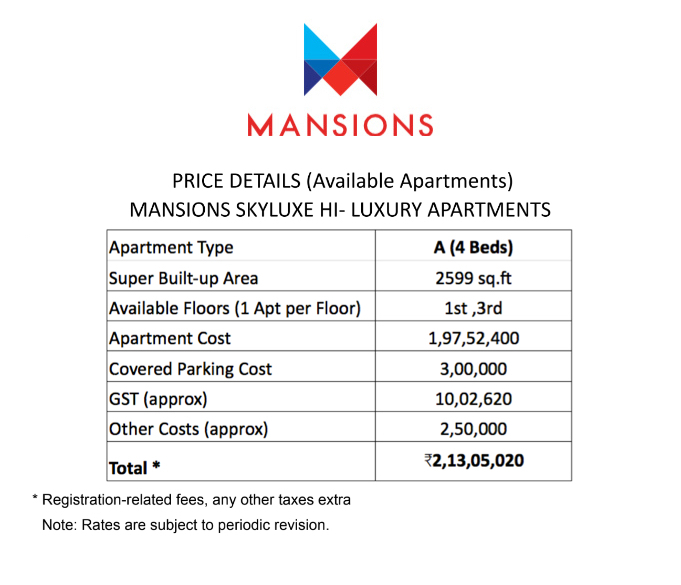 Experience the Skyluxe life – just one super- premium apartment per floor. Own a Hi-luxury bungalow in the sky, in the majestic Kowdiar neighbourhood. Luxuriate Life. Come home to a down-to- earth builder in Trivandrum: professional, technocrat-driven, trusted, with a 30-year legacy. At Trivandrum, Mansions also offers Mansions Palm Hills Apartments Peroorkada , to experience the delights of Lo'Rise living ; and Mansions Misty Meadows Villas, Thirumala, to enjoy a customised villa on Flexi Villa-Plots. Earthquake resistant RCC framed structure (designed for Seismic Zone III), 15 cm hollow concrete block masonry for outer walls and 10 cm hollow concrete block/brick masonry for internal walls. Teakwood frame for front door and hardwood frames for other doors, with moulded door shutters. Moulded half-glazed shutter for kitchen. Glazed sliding windows with powder-coated Aluminium Euro profile/equivalent and premium hardware, with insect screen. Living/Dining: Vitrified tiles of size 80 cm x 80 cm . Bedrooms: Laminated wooden flooring – AC2 grade. Kitchen and Utility Area: Group 5 ceramic tiles. Acrylic emulsion over putty for walls and ceiling, enamel paint for doors and grills. POP cornice in living and dining areas. Nirali/Franke Stainless Steel Sink with drain-board for kitchen. Single-bowl stainless steel sink for utility area. Glazed tiles above the counter upto a height of 45 cm. Sanitary Ware- White colour Kohler or equivalent. CP Fixtures- Grohe or equivalent. Walls- Premium glazed tiles upto 210 cm. Overhead water tank with pumping arrangement from borewell and KWA water supply in kitchen. Concealed 3-phase wiring with ISI-marked superior quality PVC insulated wires with modular switches of Legrande/Schneider make. Electrical points for water purifier, washing machine, mixer, refrigerator and microwave oven. Cable TV point in living room and master bedroom. Provision for air conditioners in all bedrooms.